The United States and Canada, by international comparison, are relatively low in their levels of corruption. In 2017, the U.S. ranked 17th in Transparency International’s global corruption index, while Canada was eighth. Bronskill, J. (2014, May 20). RCMP study finds 322 incidents of corruption within force during 11-year period. Ottawa Citizen. http://www.ottawacitizen.com/news/RCMP+study+finds+incidents+corruption+within+national/9854635/story.html. Burke, B., Bookbinder, N., & Eisen, N. (2017). Presidential obstruction of justice: The case of Donald J. Trump. Washington, DC: Brookings Institution. https://www.politicususa.com/wp-content/uploads/2017/10/presidential-obstruction-of-justice-the-case-of-donald-j-trump-final.pdf. Coll, S. (2017, August 10). The Trump administration rolls back anti-corruption efforts in the oil industry. New Yorker. https://www.newyorker.com/news/daily-comment/the-trump-administration-rolls-back-anti-corruption-efforts-in-the-oil-industry. Fang, L. (2014, March 10–17). Where have all the lobbyists gone? The Nation. https://www.thenation.com/article/shadow-lobbying-complex/. 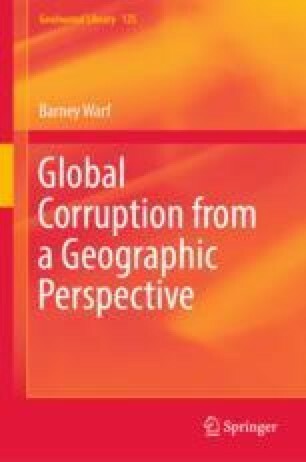 Global Anti-Corruption Blog. (2018, May 2). Tracking corruption and conflicts in the Trump administration. https://globalanticorruptionblog.com/profiting-from-the-presidency-tracking-corruption-and-conflicts-in-the-trump-administration/#govtpayments. Nelson, J. (2014, June 11). Canada not immune from corruption, E&Y study finds. Globe and Mail. https://www.theglobeandmail.com/report-on-business/canada-not-immune-from-corruption-ey-study-finds/article19130773/. Patriquin, M. (2010, September 24). Quebec: The most corrupt province. Macleans. https://www.macleans.ca/news/canada/the-most-corrupt-province/. Plummer. B. (2011, October 10). The outsized returns from lobbying. Washington Post. https://www.washingtonpost.com/blogs/ezra-klein/post/the-outsized-returns-from-lobbying/2011/10/10/gIQADSNEaL_blog.html?utm_term=.9271381c828f. Sutherland, S. (2001). “Biggest scandal in Canadian history”: HRDC audit starts probity war (Queen’s University School of Policy Studies Working Paper No. 23). http://www.queensu.ca/sps/sites/webpublish.queensu.ca.spswww/files/files/Publications/workingpapers/23.pdf. Tencer, D. (2012, February 24). Canada mining corruption: Survey finds Canadian provinces seen as riskier than parts of Africa. Huffington Post Canada. https://www.huffingtonpost.ca/2012/02/24/canada-mining-corruption-fraser-institute-survey_n_1299480.html. Williamson, K. (2015, March 23). Texas has a corruption problem. National Review. https://www.nationalreview.com/magazine/2015/03/23/texas-has-corruption-problem/. Yglesias, M. (2018, March 1). Trump’s corruption deserves to be a central issue in the 2018 midterms. Vox. https://www.vox.com/policy-and-politics/2018/3/1/17056562/trump-corruption-midterms. Zibel, A. (2018, January 18). Presidency for sale: 64 trade groups, companies, candidates, foreign governments and political groups spending money at Trump’s properties. PublicCitizen. https://corporatepresidency.org/presidencyforsale/.